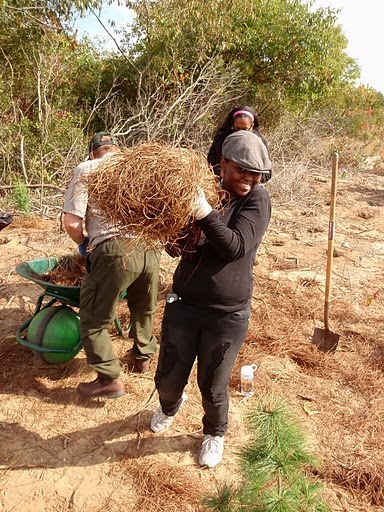 Spreading smiles along with hay around newly planted trees on Jamaica Bay. A MillionTreesNYC event with the National Park Service and NYRP. I organized the Earth Day New York contingent. Spring can bring emotional regrowth to you through exercise in nature. A critical insight illuminating American history is that Jefferson used the word “happiness” as a standard Enlightenment translation for the Classical Greek concept eudaimonia. Today academics translate this as “flourishing,” both in personal potential and value to the community. Depression and chronic stress (and even severely stressful incidents) kill brain cells, deepening depression in a vicious cycle. The good news is that the brain is much more regenerative than once believed. Both exercise and natural experiences have been shown to alleviate depression, so do yourself and your loved ones a favor — combine those benefits by enjoying outdoor recreation and active volunteer work. These activities also tend to be social. Get started on a virtuous cycle of enjoying nature and sharing the accomplishments of stewardship with other caring people! May you flourish in every season! Rest in Peace, Bernard Ente. 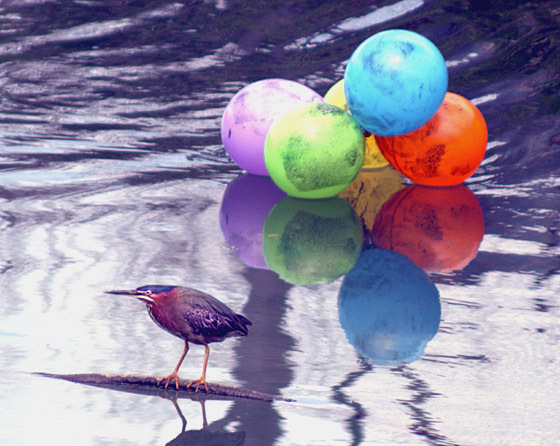 Green heron on the Newtown Creek by Bernard Ente. Bernie and I became friends six years ago when my work starting the LIC Community Boathouse brought me into the Newtown Creek Alliance. His urban nature photos brought us closer and often inspired Nature Calendar (the photo above helped to inspire this more challenging entry). He also reveled in our working waterfront heritage. He was a crusty Queens guy with a deep sentimentality in the best way, and he had a fine eye. He was kind and intelligent. His natural (or was it hard won?) skepticism never stopped him from supporting the most idealistic endeavors and over-the-horizon dreams. How else could he love a Superfund Site, the creek, as evidenced by this gallery? Many times I threatened/promised to spend a day canoeing the creek with him. He brushed the offer away with a laugh, saying that canoes were for the young — he wasn’t too old to canoe by any means. I’m very saddened that won’t happen. If you’re reading this and worry you’re too old to get out on the water this way, please get in touch with your local community boathouse and learn how happily wrong you are. Joyful adventures in nature to you, in the company of friends. Mutually fascinated mammals in New York Harbor. PLEASE FORGIVE SPACING ISSUES. WORDPRESS PROBLEM. 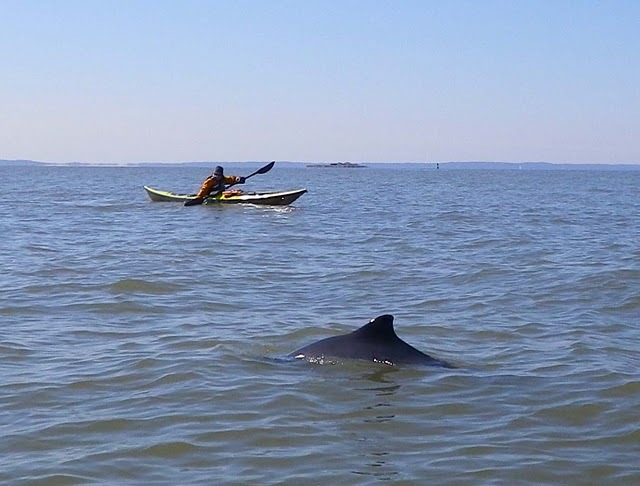 Neuroscientist and kayaker Vladimir Brezina paddled with a harbor porpoise in New York Harbor recently, and got great photos! Unlike harbor seals, which congregate and bask in the sun, these dark-backed loners are hard to spot and even more difficult to photograph. Fortunately for Vlad and friends, this porpoise seems to have bored with the pensive, hermetic life and so tagged along with a few odd fellow mammals for two miles around the Verrazano-Narrows Bridge. Being sociable with other species isn’t always a winning strategy for harbor porpoises, which occupy habitats hugging shorelines and inlets quite near humans and other predators. The species name comes to us via French from compounding two Latin words: porco (pig) and piscus (fish). This name doesn’t hold the promise of reverence. Harbor porpoises mate promiscuously but have only one pup per year. Some researchers argue that the species might be divided into “races” by region in the northern Atlantic and Pacific and the Black Sea. Despite having such a slow rate of reproduction, the species isn’t endangered. Existence is perilous, however, for individual porpoises. They were once hunted for blubber and are still often ensnared in fishing nets. An ongoing hazard in such close quarters with humans is poisoning by pollution. Even dolphins slaughter small and often solitary harbor porpoises to eliminate competition for food in lean times. Naturalists have recently witnessed this intra-cetacean ruthlessness along the shores of Scotland. New York Harbor, on the other hand, is experiencing a resurgence of marine mammal populations in recent decades. It’s unclear if this is because of local environmental improvements or an unrelated increase in ocean prey stocks that sustain whales, dolphins, porpoises, and seals. Vlad and other paddlers, including myself, first documented the return of seals to New York Harbor in numbers after a 120-year absence. I broke the story is this New York Times article (the editor made the headline, which confuses seals with sea lions). The Narrows passage seems to be a unsung hot spot for sighting large creatures. Perhaps this is because migrating fish and tide-riding food sources tightly funnel through this stretch between the Upper and Lower Bays of New York Harbor. Earlier in the last decade I enjoyed a blue shark encounter (rare for inland waters) here and Wildlife Conservation Society marine biologist Paul Sieswerda was once privileged to see a juvenile fin whale between 40′-50′ long swimming toward the bridge and then back out to sea. Sadly, large ships sometimes drag fin whale carcasses into the harbor on their bulbous bows. If you ever spot a sea mammal or turtle in New York Harbor (either healthy or in distress), or want to volunteer with rescues and care, please contact the Riverhead Foundation. The best way to get out there with the porpoises, whales, seals, and other aquatic wildlife is by kayak, sailboat, or rowboat. To get started, volunteer with the NYC Water Trail Association community boathouse that’s best for you or go for instruction with one of our fine local outfitters. Another option is to bike along one of our greater waterfront greenways. Bird Strikes…Wait, what? Isn’t that a Plane Strike? Still, many people have asked for links to learn more about bird strikes, and the estuary birds of our region. So here’s a quick link list! And now a hot apple cider toast to the pilot! Let’s hope the authorities focus on better detection and avoidence and not fewer birds!